The fairy godmother of Cinderella is very old and does not remember the magic spell of turning Cinderella into a princess. 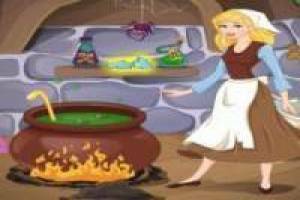 In this game you have to find out the perfect combination of the magic spell by inserting objects into the spell cauldron. You can not imagine the surprise that our Cinderella will take. Enjoy the game Spells of Cinderella, it's free, it's one of our Cinderella games we've selected.